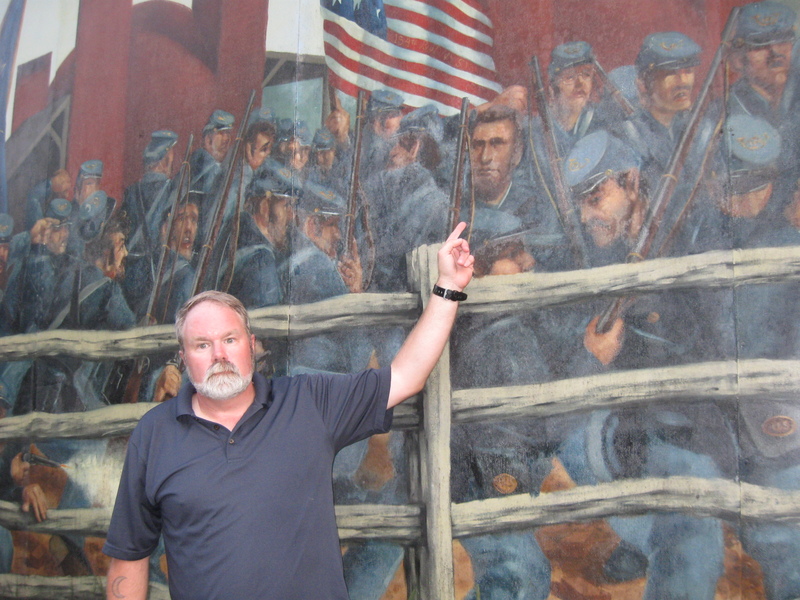 Gettysburg Licensed Battlefield Guide Stuart Dempsey is standing on Coster Avenue, in front of the Coster Avenue Mural. This view was taken facing southeast at approximately 7:45 PM on Saturday, July 18, 2010. 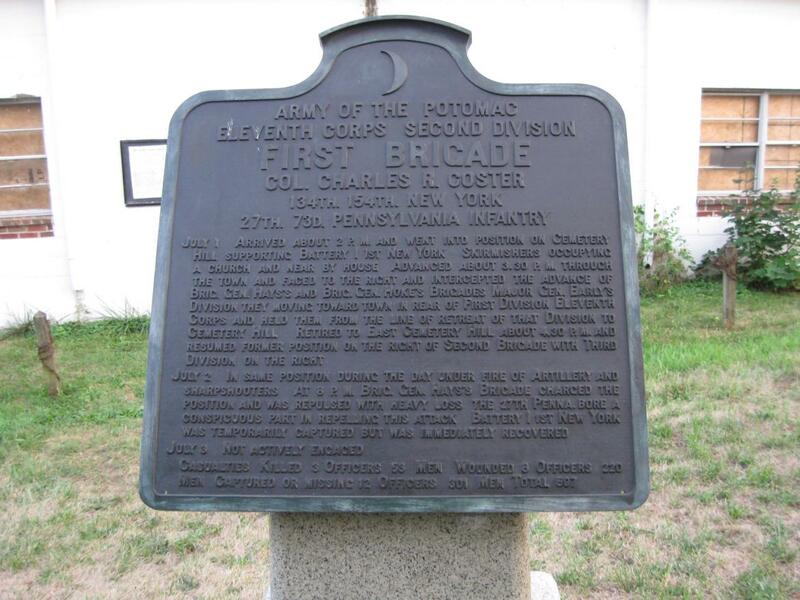 In today’s Eleventh Corps post, Gettysburg Licensed Battlefield Guide Stuart Dempsey describes the fighting at Coster Avenue, and the retreat of the 45th New York on the afternoon of July 1, 1863. This map shows the location of where our Eleventh Corps at Gettysburg videos were produced. Videos #1-#73 were shown on other maps on our previous posts. In Video #74 was taken on Coster Avenue. 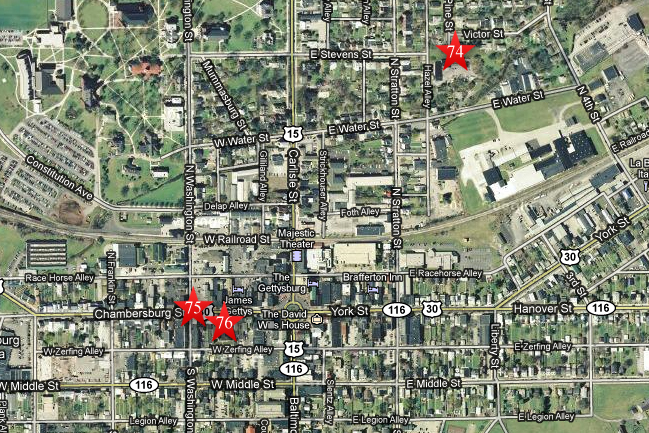 Video #75 was taken at the northeast corner of the intersection of Chambersburg Street and Washington Street. 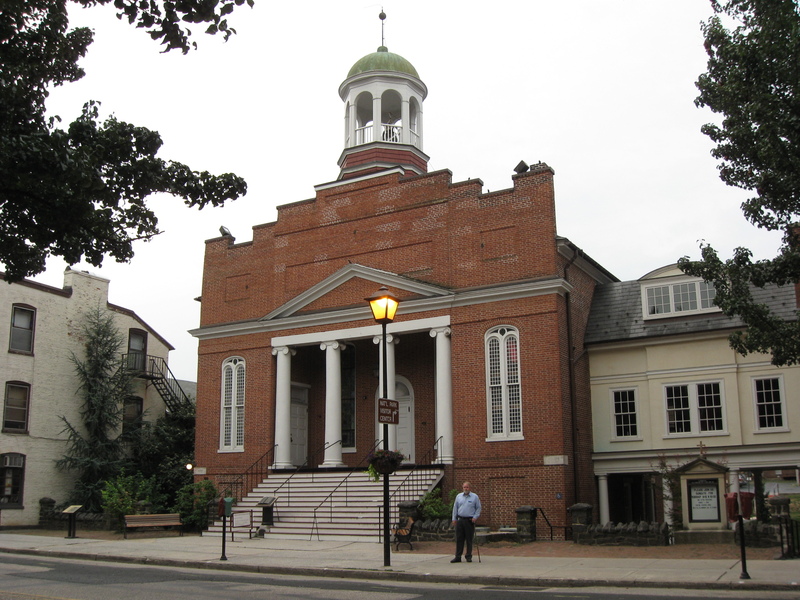 Video #76 was taken at Christ Lutheran Church on Chambersburg Street. This map was created facing north at approximately 9:00 PM on Friday, October 15, 2010. 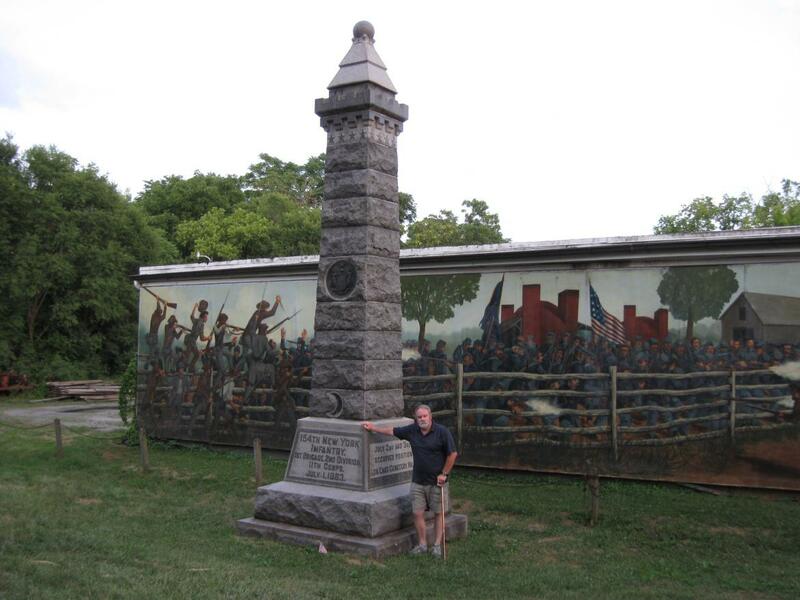 Gettysburg Licensed Battlefield Guide Stuart Dempsey is standing by the monument to the 154th New York Infantry Regiment on Coster Avenue. This view was taken facing southeast at approximately 7:45 PM on Saturday, July 18, 2010. In Video #74 (Videos #1-#73 were shown in our previous Eleventh Corps posts) Gettysburg Licensed Battlefield Guide Stuart Dempsey is standing on Coster Avenue, which is an extension of Stevens Street. He describes the action of Coster’s Brigade. This view was taken facing south to southeast to southwest to south to east at approximately 7:45 PM on Saturday, July 18, 2010. Gettysburg Licensed Battlefield Guide Stuart Dempsey is standing by the marker to Coster’s Brigade on Coster Avenue. This view was taken facing south at approximately 7:45 PM on Saturday, July 18, 2010. A closer view of the Coster marker. This view was taken facing south at approximately 7:45 PM on Saturday, July 18, 2010. Gettysburg Licensed Battlefield Guide Stuart Dempsey is pointing out Sergeant Amos Humiston of the 154th New York Infantry Regiment. This view was taken facing south at approximately 7:45 PM on Saturday, July 18, 2010. Licensed Battlefield Guide Stuart Dempsey is standing at the northeast corner of the intersection of Chambersburg Street and Washington Street. 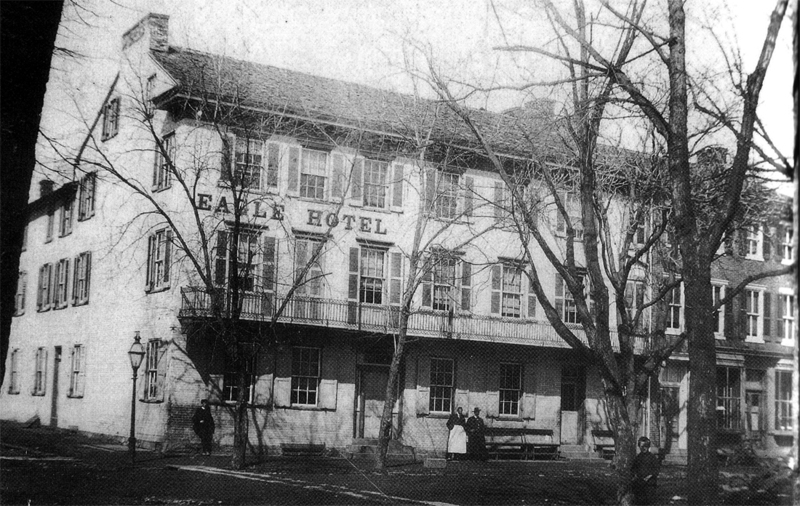 The Eagle Hotel was located behind Stuart in 1863. This view was taken facing northeast at approximately 7:00 AM on Sunday, August 1, 2010. In Video #75 Licensed Battlefield Guide Stuart Dempsey is standing on the northeast corner of the intersection of Chambersburg Street and Washington Street. 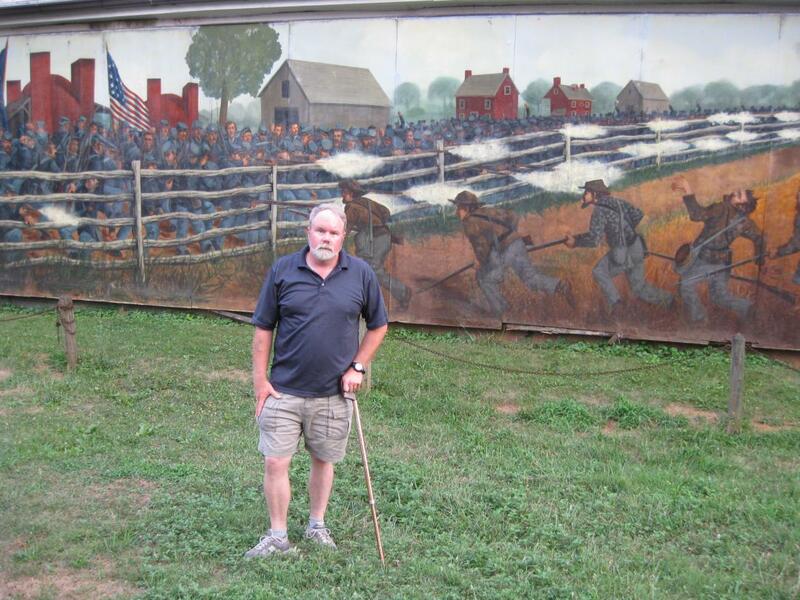 He describes how the 45th New York Infantry Regiment attempted to retreat through this area on July 1, 1863. This view was taken facing north to south to southeast at approximately 7:00 AM on Sunday, August 1, 2010. The Eagle Hotel was at first a two story building constructed in the early 1830s. The third story of the structure was added circa 1857. It functioned as a stop on the stage coach line from Chambersburg to Gettysburg. It was also used as a gathering place for the Republican party. The Democrats used the Globe Inn on York Street. A fire destroyed this building in 1894. It was replaced by larger versions of the hotel until a fire destroyed the last structure in 1960. A gas station was located here before the 7-Eleven convenience store. This view was taken facing northeast circa 1888. Stuart Dempsey is standing in front of Chambersburg Street’s Christ Lutheran Church. This view was taken facing southeast at approximately 7:00 AM on Sunday, August 1, 2010. 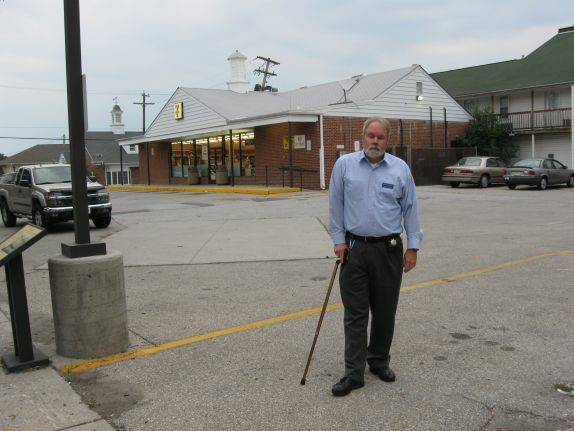 In Video #76 Stuart Dempsey is standing in front of the Christ Lutheran Church on Chambersburg Street. 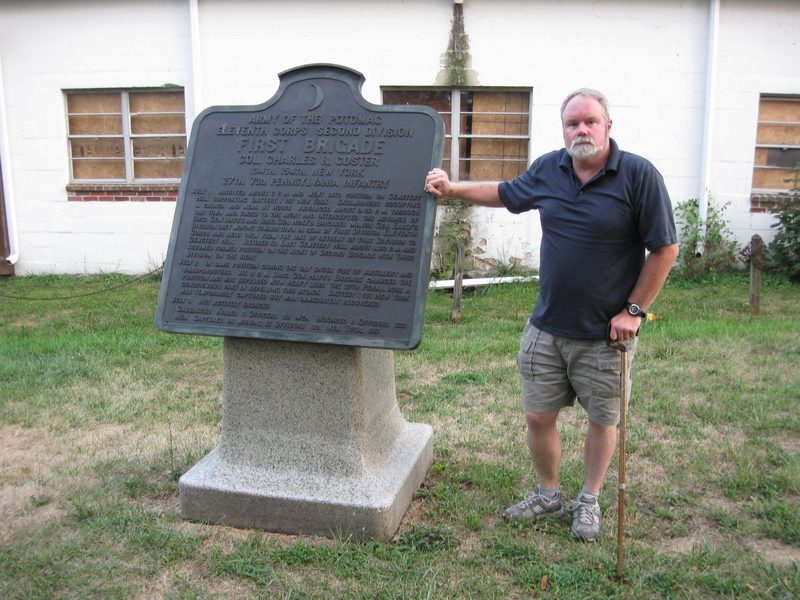 He describes how the 45th New York Infantry Regiment attempted to escape and ultimately have to surrender in this area on July 1, 1863. Captain Francis Irsch made several escape attempts – most notably he was a part of the big Libby Prison break in February 1864. However, he was recaptured during this attempt and returned to prison. It appears that he was transferred to a couple other Confederate prisons before war’s end and was not released until 1865. This view was taken facing east to south to west to northwest at approximately 7:00 AM on Sunday, August 1, 2010.